Another day, another example of how mobile graphics are snapping at the heels of desktops and laptops. But today Nvidia has truly gone from talking the talk to walking the walk, showing off Project Logan – its first mobile chips that shares the same Kepler graphics architecture found in its recent desktop GPUs. Nvidia's first Tegra 4 devices, including Shield, are set to hit the market soon, but the company is already getting serious about the future. While Nvidia says it's still early days, it plans to get what will likely arrive as Tegra 5 off the production line and into the market in the first half of next year. While Nvidia is still holding back on detailing some of the spec jumps over Tegra 4, it has said that the new chip will use less than a third of the power consumption of GPUs in today's tablets such as the iPad. 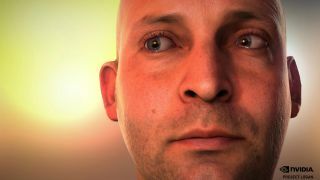 And in case Nvidia's word just isn't good enough for you, it's also put up some footage of the chip running Ira, its face expression demo that was shown off earlier this year running on a desktop PC.